Here's the goose beak is a medieval flotrentine proverb. This phrase can be used to indicate that a chore is carried out cheerfully and to perfection. Let me make a digression on salt in lieu of the new of EU Regulation 1169/2011 on nutrition labelling. On the new nutrition label, in fact, you will find the sodium content to be expressed not as sodium, but just as salt. This data gives you the opportunity to compare it to the recommended amounts and to the other products. We must remember that we consume 50% more salt than the recommended amount given out by the World Health Organization (WHO) which is 5 grams of salt a day. A good compromise could be to not exceed 6 grams per day. As we all know the excessive consumption of salt is related to body fluid retention and increased blood pressure: a risk factor for cardiovascular disease. In the wide range of processed products, Salami are generally more rich in salt, which is used as a preservative and to improve the flavour of the products. The use of Cervia Salt that improves the flavour of our products at lower doses. This multidisciplinary approach has allowed us to reduce the salt content of our goose products 20% less than other pork products. Enhancing in fact the flavour and freshness of the Italian lean goose meat on one hand, and making the goose products not only gourmet, but also healthful for a modern lifestyle. The Italian Society of Human Nutrition has given some pointers on how to properly interpret the values ​​of food salt content. Therefore, cooked goose salami with a salt content no greater than 1.2 g/100 g of product can be considered a good compromise between the pleasures of the table and a modern lifestyle. "Andare in oca" literally “To go in goose (mode)” is a popular and figurative saying which has slightly different meanings depending on the area. In northern Italy it means confused, while in Ticino in Switzerland it means to forget something. We are really sure about what we eat? Chefs and gourmets have praised for centuries the goodness and delicacy of goose and duck foie gras, excellent European traditional preparation. But not everyone knows where this product comes from. The foie gras is the goose liver obtained by overfeeding and fattening birds such as geese and ducks that are grown and then force-fed in the last period of their lives . They are immobilized to avoid movement, these animals are fed with the aid of long tubes which " inject " the feed directly into their digestive system . This force-feeding , in technical jargon is called gavage , and it allows to bring the weight of the liver to about 1 kg at the steatotic state in a short time. France, Hungary, Spain, Belgium, Bulgaria are the only EU countries that can still produce foie gras. Italy has forbidden this practice in 2001, and so all the product on the Italian market comes from abroad. After the liver is removed, the foreign fat goose meat is considered a by-product and it is sold in markets around the world at very competitive prices. Innovation, quality and sustainability are some of the pillars of the mission of Oca Sforzesca . Added to these is the focus on animal health and the procedures that allow our goose breeding to yield excellent lean goose meat and healthy delicate goose livers of about 100 g.
Wide breading grounds, shelter from the cold during the night and autonomy as far as feed is concerned are the characteristics that distinguish the Oca Sforzesca’s goose production 100% Italian chain. 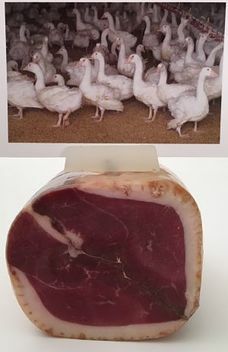 From our goose breedings we get lean goose meat to precess into excellent cold cuts in the respect of animal welfare. Our goose meat has an excellent lean-fat ratio for a healthy and nutritious diet. Now you know the farming practices that concern it. Now you know where the goose meat comes from. Now you know how it is raised.